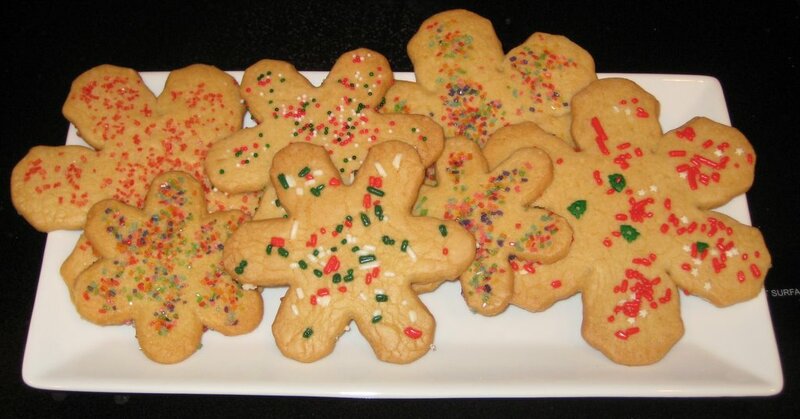 It’s great to get your kids cooking in the kitchen and Sugar Cookies for the holidays are ideal because the kids love to decorate them as much as eat them. I have a recipe I think makes the best sugar cookie and it’s easy to work with. Even though this recipe works fine with non-organic I use almost all organic ingredients. The sprinkles are harder to find in the holiday colors. I’ll write the recipe with young cooks in mind so that it’s easy for them to follow. And for the holidays we’ll use some decorative cookie cutters. I use my Kitchen Aid Stand Mixer to do all my mixing but if you have a good hand mixer it will do the job. 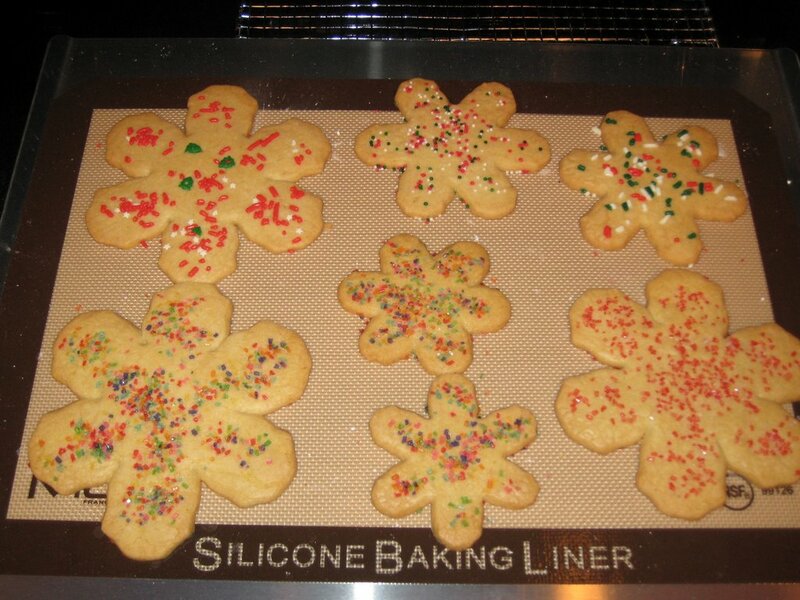 A Silicone Pastry or Baking Sheet is great to bake the cookies on but don’t cut the cookies on it or the cutters could damage the sheet. Place the room temperature butter in the mixing bowl and mix until creamy. Sift the powdered sugar and slowly mix into the butter so that sugar doesn’t fly everywhere. Cream (beat together) until fluffy. Crack the egg into a little dish or cup and then add to the creamed butter and sugar mixture. Mix well. 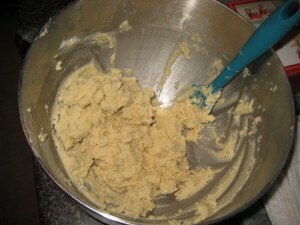 Slowly add the flour and baking soda and mix until well blended and smooth. At this point your dough looks a little clumpy and stiff but is sticky. Scoop the dough out onto a large piece of plastic wrap and shape it into a flattened ball. Wrap tightly and refrigerate for at least an hour. 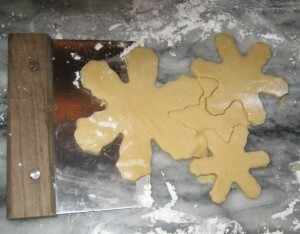 Remove about half the dough and roll out on a lightly powdered sugar surface until 1/4 inch thick. 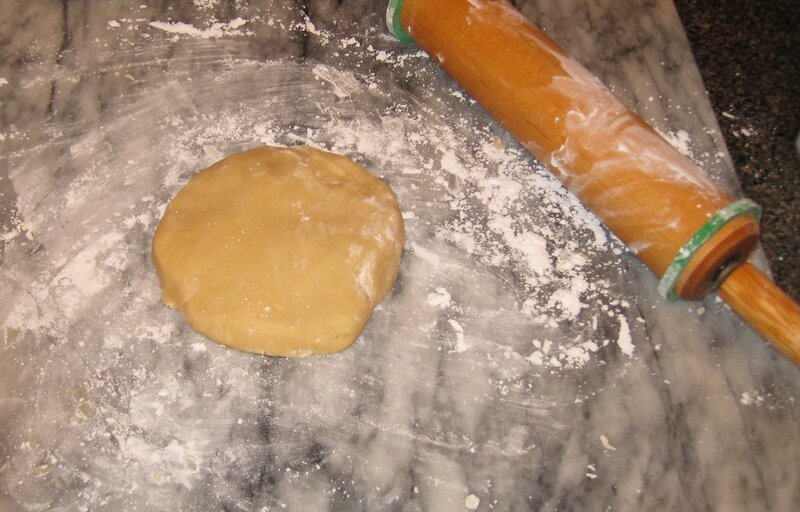 I use my rolling pin rings to make sure the dough is even. 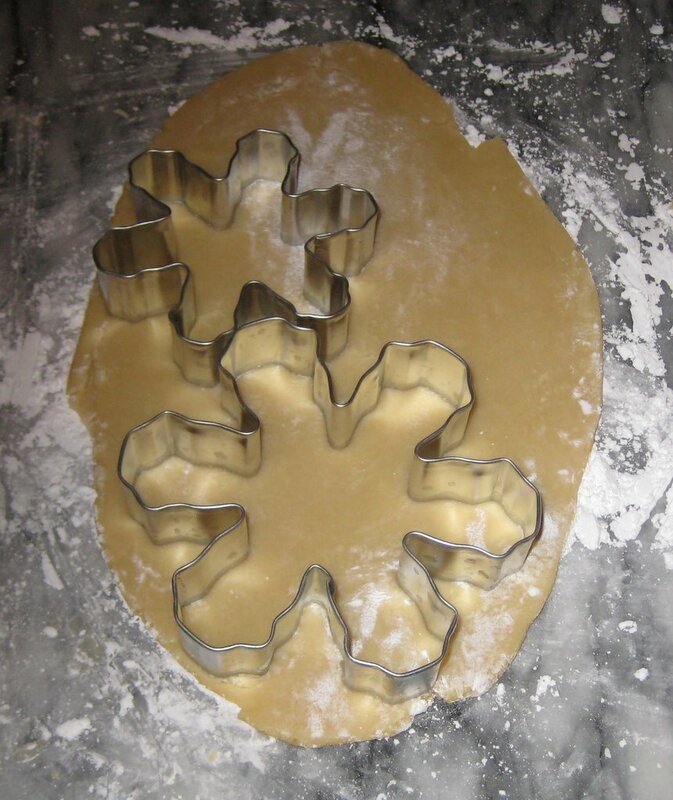 Use cookie cutters to cut into desired shapes. 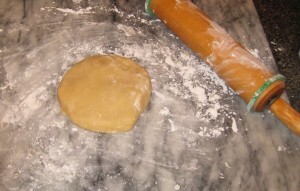 Place cutters on rolled out dough and press firmly. You can place more than one cutter to help with spacing. If your dough gets soft or sticks to the board use a pastry scraper and slide it under the cookie to lift without losing the shape. Another way is to keep the cookie cutter in place while you lift the cookie to the baking sheet. Place on a cookie sheet for baking. 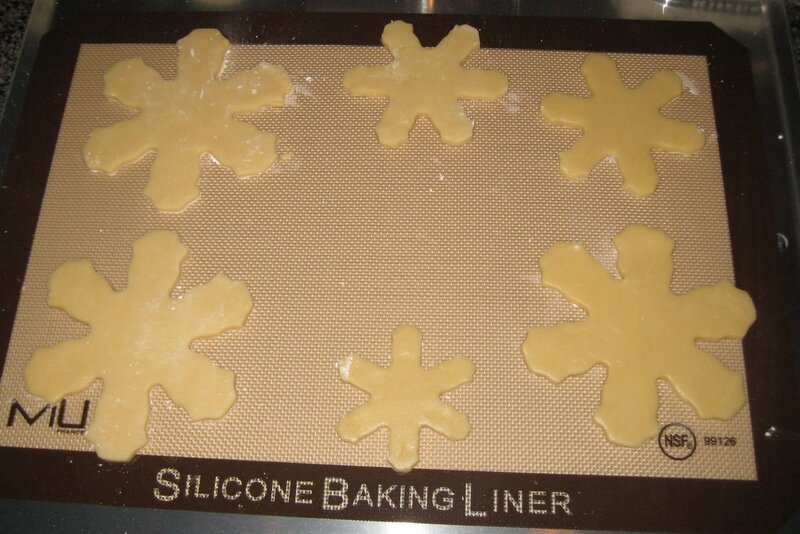 The Silicone Baking Liner to keep them from sticking and browning too much on the bottom. Don’t worry about the powdered sugar left on the cookies, it will melt into the cookie when it bakes. Now, if your going to decorate with sprinkles scatter them on your cookies. Bake in a 350F oven for 8 to 10 minutes. I notice my thicker cookie sheet takes longer so start with the 8 minutes and then keep watching them until they’re done. Remove from oven when just lightly browned. 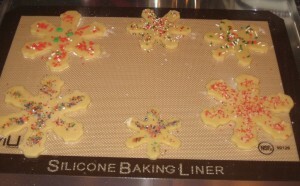 Let the cookies cool for a few minutes on the cookie sheet before removing to a cooling rack or paper towels on the counter. If you’re going to frost your cookies make sure they are cooled completely. Check my upcoming post on frosting. I’ve noticed when using organic powdered sugar it is a little clumpy. Sifting it makes it easier to cream with the butter. 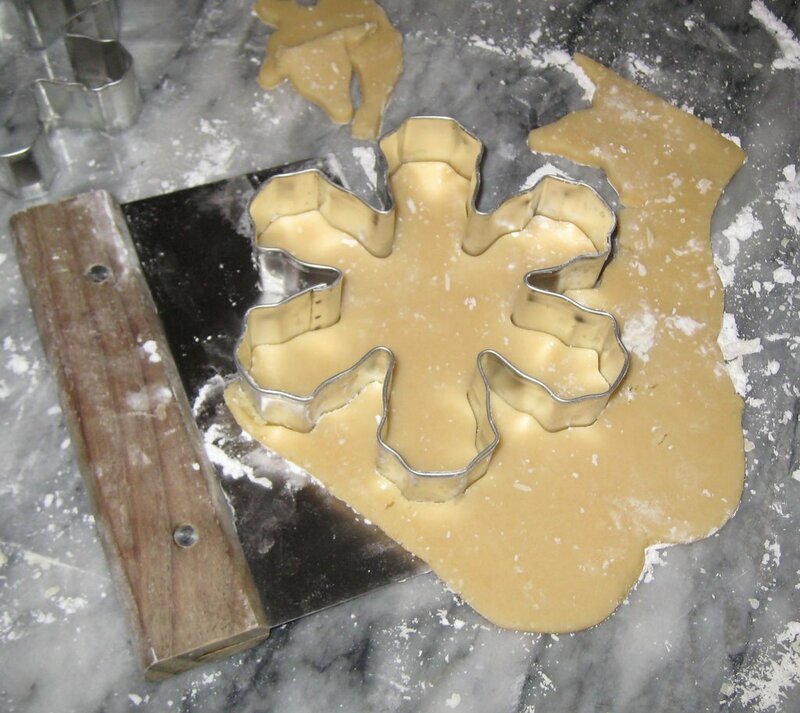 For those of you with granite counter tops you have an ideal surface for rolling out the cookie dough and your cookie cutters won’t damage the surface. 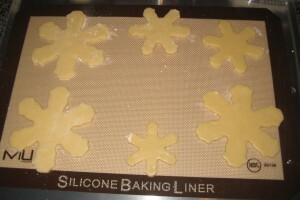 I have a large Marble Pastry Board I use on my other surfaces and it works great. It’s heavy and I’ve carried it around with me for at least 30 years, with many cross-country moves so they hold up well.